LAS VEGAS — Entering Friday night’s Stratosphere 200 at Las Vegas Motor Speedway, Kyle Busch had won a NASCAR Camping World Truck Series race at every facility he’d raced on in the division, except his home race track. By the end of the night, not only had Busch changed that statistic, he’d added his 50th-career Truck Series win to the record book as well. Busch led six times for a race-high 55 laps, but his eventual triumph at the end of the Stratosphere 200 was far from easy. The former Monster Energy NASCAR Cup Series champion had to fend off an early charge from Stewart Friesen and late charges by both Brett Moffitt and Johnny Sauter before he could finally seal the deal on the milestone win. Moffitt, in particular, gave Busch fits during the race’s second half — leading for 25 straight laps at one point as Busch tried and tried to find a way past. Eventually, though, Busch persevered and capitalized on a tough break for Moffitt. The on-track pass for the win came when Busch hauled around the outside of Moffitt exiting turn two, after Moffitt made contact with the slower lapped truck of Frenchman Michel Disdier. But that contact came right in the middle of the final round of green flag pit stops, which saw Moffitt pit for tires, fuel and slight repairs with 23 to go and Busch make his final stop for service three circuits later. 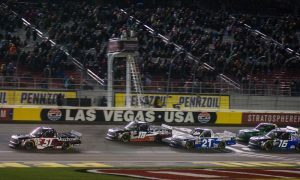 As the pit cycle worked its way towards completion, a spin by Disdier in turn four brought out the yellow flag with 16 to go and set up a sprint to the finish with Busch and teammate Noah Gragson on the front row for the final restart of the night. The green flag waved with 11 laps left and Busch took off, while behind him the field scrambled three and four-wide for position before Moffitt eventually cleared the pack to take over the runner-up spot, giving chase to Busch. Moffitt drafted right up to the bumper of the No. 51 Cessna Toyota and appeared to be setting up a potential pass for the win, but was slowed up trying to pass the lapped truck of Norm Benning and ultimately lost second to Sauter with four to go. 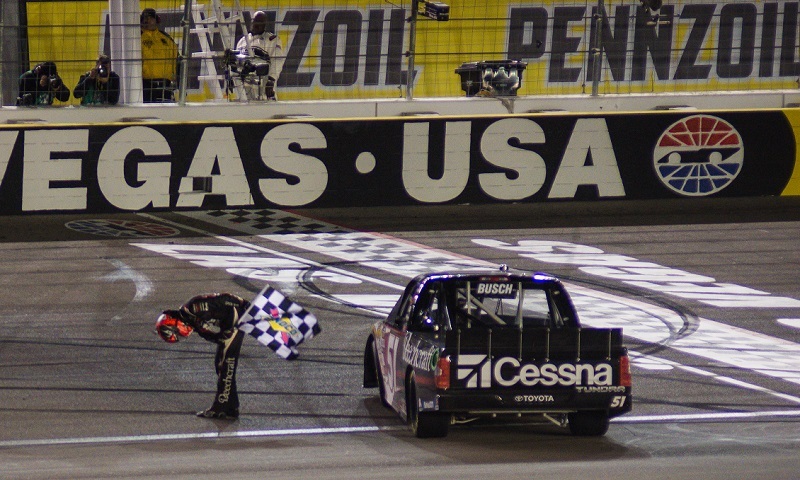 But even Sauter had nothing for Busch, who held on over the final laps to grab his first Truck Series win at Las Vegas and move to within one victory of Ron Hornaday’s all-time series record. Sauter fended off Moffitt for second, but was thoroughly dejected after the race at not being able to seal the deal. Grant Enfinger crossed the line in fourth, with stage two winner Friesen completing the top five. After restarting second on the final green flag, Gragson faded to 12th in the final rundown. The NASCAR Camping World Truck Series returns to action March 24 at Martinsville Speedway.